Find out who is really buried at Honor's Rest. Honor's Rest — Uncover the mystery behind Honor's Rest. Lozruth and Sharela discovered a lost tomb, but they disagree on who rests within. Talk to Lozruth and Sharela. Find the keys to open the tomb in the catacombs. Learn the truth about the duel between Gaiden Shinji and Baloth Bloodtusk. One of the memorial pools (Tamahl's?) is located in the Eastern Halls (two rooms southeast of the main chamber in the catacombs), the other (Arakaul's?) is located in the Western Halls – however you have to go around the long way as the door is locked from the inside and there's a rock fall in the connecting passage. Not sure if the locations relate to the urns or if the first one you pick up will always be Tamahl. Lozruth believes they found the tomb of Baloth Bloodtusk, a great Orc hero who died at the siege of Old Orsinium. I said I would speak with Sharela about her objections to his theory. 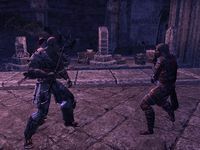 Sharela believes they found the tomb of Gaiden Shinji, a great Redguard hero who also died at the siege of Old Orsinium. She thinks the key to opening the tomb can be found in the nearby catacombs. I should search for the entrance to the catacombs. Objective: Find the entrance to the catacombs. Sharela thinks the key to opening the tomb can be found in the nearby catacombs. I should examine the monument stone near the catacomb entrance. Objective: Examine the monument stone. A pair of burial urns should unlock the tomb doors. It seems I must find and drink from a pair of memorial pools to release the urns. I should search for the pools in the catacombs near the tomb. Objective: Drink from the first memorial pool. I was drawn into a memory of past events, prior to the destruction of Old Orsinium. It seems I walk in the shoes of Tamahl, one of Gaiden Shinji's followers. I should speak with him and see what I can learn. Objective: Talk to Gaiden Shinji. I was drawn into a memory of past events, prior to the destruction of Old Orsinium. It seems I walk in the shoes of Tamahl, one of Gaiden Shinji's followers. Now that I've learned what I could, I should find a way to awaken from this memory. When I awoke from the memory of Tamahl and Gaiden Shinji, the waters parted to reveal a hidden alcove. I should collect Tamahl's burial urn. Objective: Take Tamahl's burial urn. I collected a burial urn filled with the ashes of Tamahl, one of Gaiden Shinji's followers. I should search the catacombs for another memorial pool to find the second burial urn. Objective: Drink from the second memorial pool. I was drawn into another memory of past events, prior Old Orsinium's fall. Now I walk in the boots of Arakaul, one of Baloth Bloodtusk's followers. I should speak with him and see what I can learn. Objective: Talk to Baloth Bloodtusk. I was drawn into another memory of past events, prior Old Orsinium's fall. Now I walk in the boots of Arakaul, one of Baloth Bloodtusk's followers. I've learned what I could, so I should find a way to awaken from this memory. When I awoke from the memory of Arakaul and Baloth Bloodtusk, the waters parted to reveal a hidden alcove. I should collect Arakaul's burial urn. Objective: Take Arakaul's burial urn. I collected both burial urns; one of Arakaul, an Orc lieutenant of Baloth Bloodtusk, and the other of Tamahl, the Redguard disciple of Gaiden Shinji. I should bring them to Sharela. Objective: Bring burial urns to Sharela. I should place both burial urns to unlock the tomb doors. Objective: Place Arakaul's burial urn. Place Tamahl's burial urn. I unlocked the tomb doors. I should enter with Lozruth and Sharela. It seems they were both right. This is the tomb of Gaiden Shinji and Baloth Bloodtusk – supposedly, two mortal enemies. I should look for an explanation of why this is possible. I was drawn into another memory of past events, during the fall of Old Orsinium. I walk in the boots of Commander Reliana, a Knight of the Dragon. A wounded Orc has approached me. I should speak with him. I was drawn into another memory of past events, during the fall of Old Orsinium. I walk in the boots of Commander Reliana, a Knight of the Dragon who learned General Mercedene planned to interfere with the duel of Gaiden Shinji and Baloth Bloodtusk. I should warn Lord Trystan, quickly! Objective: Warn Lord Trystan of General Mercedene's betrayal. I was drawn into another memory of past events, during the fall of Old Orsinium. I walk in the boots of Commander Reliana, a Knight of the Dragon who arrived too late to stop General Mercedene's betrayal. Gaiden Shinji and Baloth Bloodtusk are dead. Lord Trystan is wounded – I should speak with him. Objective: Talk to Lord Trystan. I was drawn into another memory of past events, during the fall of Old Orsinium. I walk in the boots of Commander Reliana, a Knight of the Dragon. Lord Trystan asked me to pursue and confront General Mercedene for the murder of Gaiden Shinji and Baloth Bloodtusk. I was drawn into another memory of past events, during the fall of Old Orsinium. I walk in the boots of Commander Reliana, a Knight of the Dragon. General Mercedene is dead. I should inform Lord Trystan. Objective: Report to Lord Trystan. I was drawn into another memory of past events, during the fall of Old Orsinium. I walk in the boots of Commander Reliana, a Knight of the Dragon. Her commander, Lord Trystan, vowed to honor the dead. I should find a way to awaken from this memory. Objective: Leave Commander Reliana's memory. This tomb is the resting place of both Gaiden Shinji and Baloth Bloodtusk. I should inform Lozruth of what I experienced. Finishes quest I should speak with Sharela about the tomb.